This is a fabulous tiny little transferware ointment pot or crock, circa 1880. It once contained a miraculous salve. 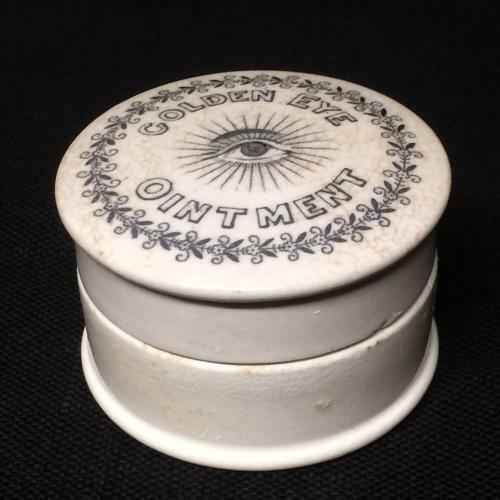 This ointment was made and sold by a family of Chemists, well known "snake oil" salesmen in Britain. The product was shear quackery. The crock was made in the Staffordshire district and is transfer printed in black. The name of the product is printed around the pot. The tiny crock stands a mere 1 1/4 " tall and 1 7/8” wide. It is thinly potted with a precision cut rim and crisp, finely applied transfer. It is in great condition with light age crazing.